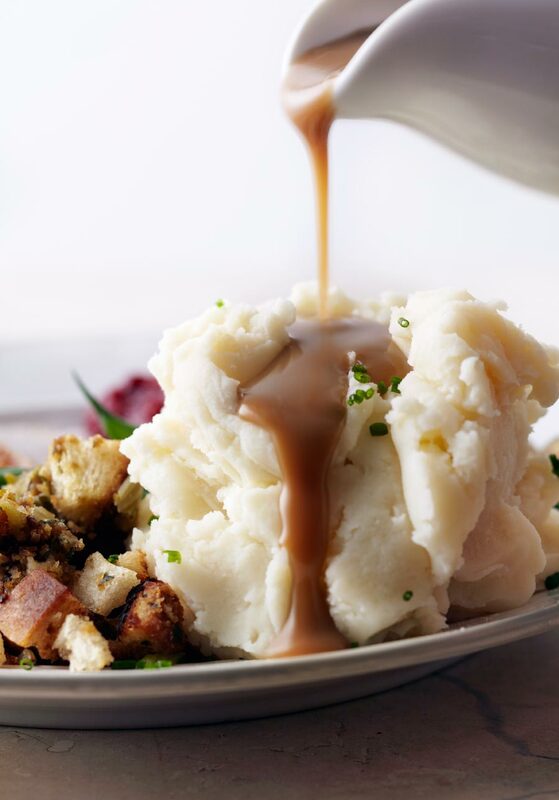 Go the classic route this Thanksgiving with Chef Corbin’s own tried-and-true family recipe, complete with Woodbridge by Robert Mondavi Chardonnay infused Butterball turkey gravy and root vegetables. Remove the turkey from the package, and pat with paper towels. Preheat your oven to 325°F (160°C). Place breast up on a rack in a shallow roasting pan and rub with vegetable oil. Place the Butterball turkey neck and giblets with the sliced onions, carrots and celery in the roasting pan. Place the fresh sage into the turkey cavity with the reserved whole peeled onion. Roast uncovered for 3 hours and 30 minutes. After 3 hours check for doneness with a meat thermometer. The minimum temperature deep in the thigh should be 180°F (82°C). When cooked, remove the Butterball turkey from the oven and allow to rest for 20 minutes before carving. Keep the roasted neck, giblets, celery, carrots and onions in the roasting pan with the Butterball turkey until you are ready to make gravy. While the turkey is resting, prepare the vegetables. Preheat your oven to 325°F (160°C). Combine all ingredients for the reduction into a small saucepan and place over medium heat. Continue to heat and reduce liquid by half.In a large mixing bowl, combine the assorted chopped vegetables with the fresh rosemary and wine reduction. Toss all ingredients together gently and season with salt and cracked black pepper. Place the mixed vegetables onto a large roasting pan lined with parchment paper. 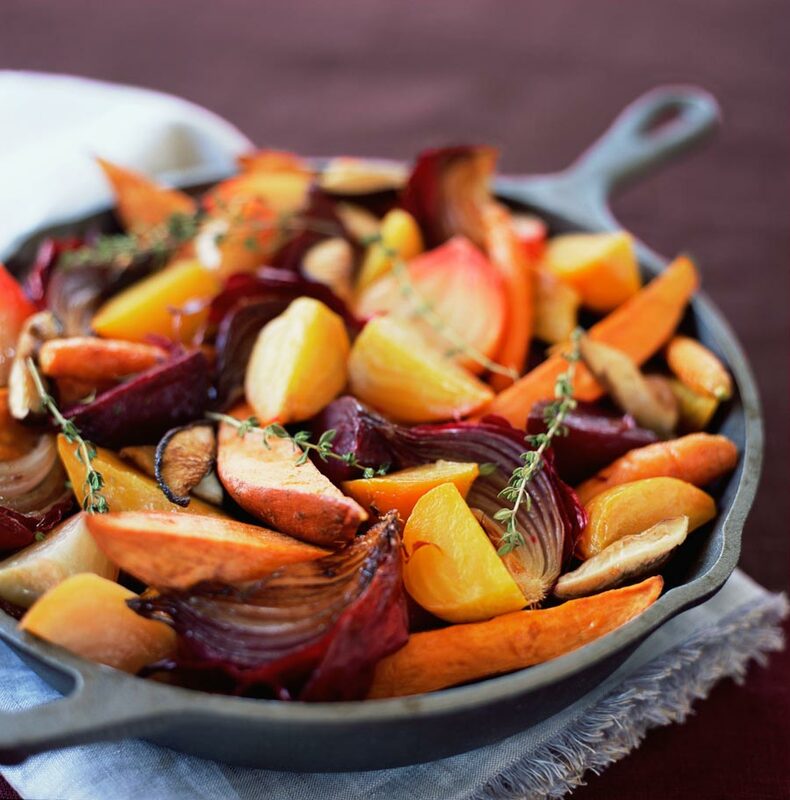 Roast the vegetables until caramelized and tender (approximately 30 minutes). While vegetables are roasting, prepare gravy. Remove the roasted turkey neck, giblets and vegetables from the roasting pan and discard. Combine the flour and turkey drippings together over medium heat to form a roux. Stir and cook together for 3 minutes. Add the warm chicken stock and stir with a whisk. Bring to a boil and reduce heat to a low simmer for 15 minutes. Season the gravy with salt and pepper and add the dry sage. 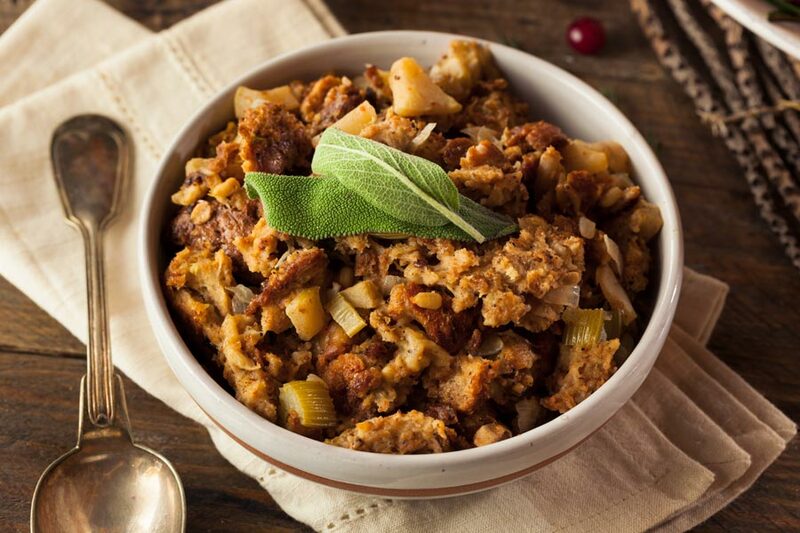 Rich in flavour and texture, this Thanksgiving recipe shines a spotlight on the families’ favourite fixing: stuffing. Flavourful sourdough bread pieces, sharp chestnuts and salty bacon bits are balanced by the bright, fruit-forward expressions of Woodbridge by Robert Mondavi Sauvignon Blanc. ½ lb (230 g) dried chanterelle mushrooms reconstituted in warm water. Preheat the oven to 325°F (160°C). Spread the bread cubes in an even layer on a large baking sheet and bake, rotate bread a few times, until light golden brown, about 15 minutes. Allow to cool and then transfer to a large bowl. Combine the mushrooms on a baking sheet, toss with 3 tablespoons olive oil and season with salt and pepper. Roast in the oven, stirring several times, until soft and golden brown, about 25 minutes. Meanwhile, heat the remaining 1-tablespoon (15 mL) of oil in a large high-sided sauté pan over medium heat. Add the bacon and cook. Stir occasionally until the fat has rendered (about 10 minutes). Remove with a slotted spoon to a paper towel-lined plate. Pour off all but about 2 tablespoons (30 mL) of the fat from the pan and place it back on the stove over high heat. Add the onion and stir for 4 minutes. Add the garlic and cook 1 minute. Deglaze hot pan with 1 cup (250 mL) of Woodbridge by Robert Mondavi Sauvignon Blanc, reduce by half and proceed. Add 3 cups (750 mL) chicken stock and the herbs, season with salt and pepper and bring to a simmer. Add the pre-cooked roasted chestnuts. Add the mushrooms to the bowl with the bread, then add the stock mixture, the bacon and the eggs; season with salt and pepper and gently stir until combined. The mixture should be very wet; add more stock if needed. Butter a 9-by-13-inch (230 mm x 325mm) baking dish. Add the stuffing and cover with foil. Bake 20 minutes, then remove the foil and continue baking until golden brown, 30 to 40 more minutes. Remove from the oven and let cool 10 minutes before serving. 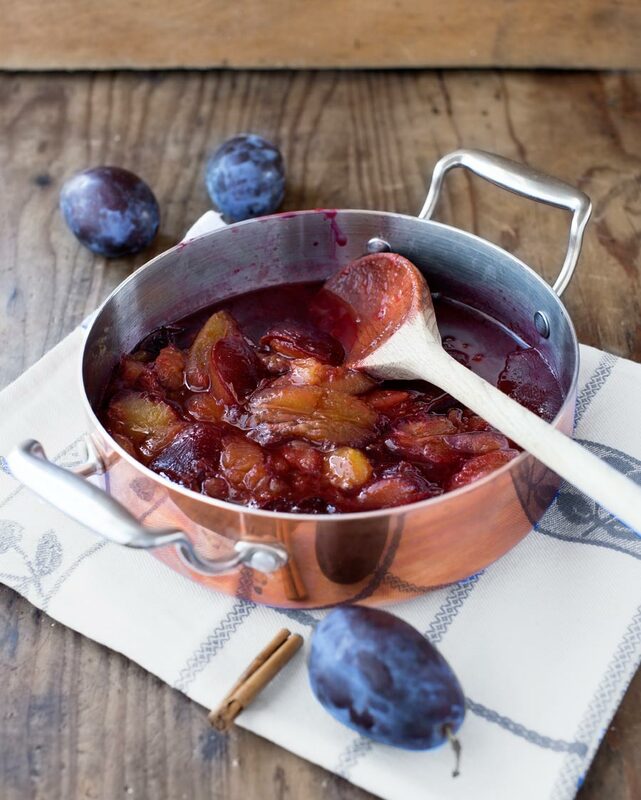 Inspired by the dance of sugar plums and the subtly spiced flavours of Woodbridge by Robert Mondavi’s Merlot, Chef Trista Sheen created a perfectly balanced Plum and Cinnamon compote that is sure to delight the palate. In a medium pot place the sugar and water. Bring to a boil on high heat. Reduce the syrup till it becomes a medium amber caramel. In the meantime make a spice bag with cloves, bay leaves, star anise, cinnamon and thyme. Once the caramel is ready, remove from heat and cautiously add the plums and merlot. Place back on the stove at medium heat and add the spice bag. Reduce the compote down to jam consistency, stirring it occasionally. Remove from heat, let cool and garnish with pecans. Rub the turkey with the vegetable oil and butter, then season all sides as well as the inside of the turkey with herbs and pepper. 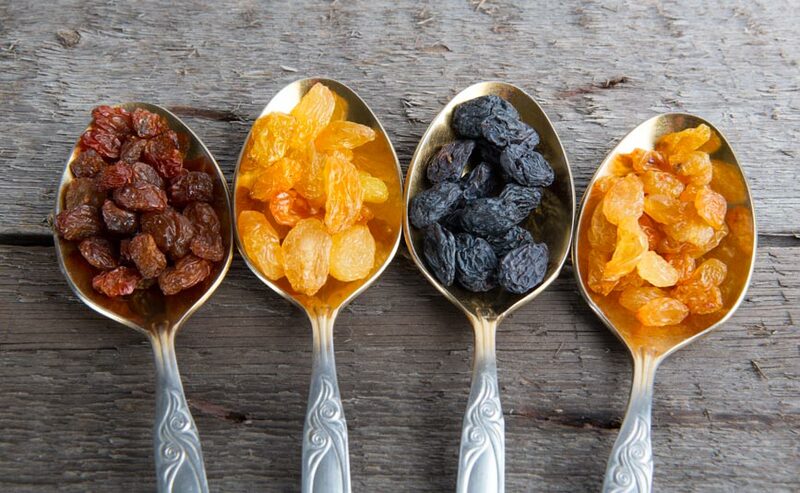 In a large bowl, stir together the wild rice, dried fruits, candied fruits and spices. Let stand for 15 minutes to allow the flavours to blend, then add 2 tbsp of water. Add the lemon zest and brown sugar, and stir to combine again. Gently fill the inside of the turkey with the scented rice stuffing. Place the turkey in a three-inch rimmed roasting pan. To prevent the skin of the turkey from sticking to the pan, place the bird on top of a layer of raw potato slices. The humidity of the potato will act as protection. Pour the chicken stock into the pan. It will enable the flavours of the spices to permeate the entire dish. From time to time, baste the turkey with the cooking liquid to thoroughly disperse the aroma with its hints of spices, sugar from the dried and candied fruits, and freshness of the lemon zest… your home is going to smell divine! Pour the Woodbridge by Robert Mondavi Cabernet Sauvignon into a saucepan and add the onion. Cook over medium heat until reduced by 2/3. Add the chicken stock and reduce until the sauce is slightly thickened. Lastly, add the 35% cream and season to taste. To add an extra bit of character to this richly flavoured sauce infused with Woodbridge by Mondavi Cabernet Sauvignon, add the zest from one orange just before serving. Slice the turkey and serve with a small amount of the scented rice stuffing. Drizzle both with some of the cooking juice.